Harnessing the Power of Falcon for Your Festival Social Media Strategy. Three ways a social media management platform can make a huge difference for big event organizers. As a Customer Success Manager at Falcon.io, I’m in charge of onboarding customers and training them with our platform. I help drive usage and adoption for a portfolio of mid-sized businesses and enterprise-level clients. As their trusted social media platform advisor, I always try to be hands-on with my customers when it comes to prepping for projects. I work with a number of entertainment and music production companies that organize large festivals, events, and pop-up shop activations. These include Founders Entertainment, producers of The Governors Ball Music Festival in New York City. This event saw a tireless seven-person social media team handle social customer service for a crowd of 150,000 people over three days. As you can imagine, that was no small task. But they came through with flying colors, with the help of the Falcon social media management platform. Based on that experience, I would like to offer some tips on how you too can use Falcon to make everyone’s lives easier at big events. Laura Hymes (Founders Entertainment) and Matt Lugo (Falcon.io) touring the festival grounds before the gates opened. Content calendar and pool: Plan your work, then work your plan! You would do well to make Falcon.io your BFF when managing social media at a heavily-attended festival—not just on the day (or three days in this case), but when promoting the event as well. One of the first steps for any company organizing an event is to publicize it. Brands love to generate buzz for their upcoming festivals by posting content that includes lineup teasers, giveaways, and food announcements. Festivalgoers enjoy nachos. Food promotions before and during the event are an important consideration. The food lineup was curated by The Infatuation. Founders Entertainment, who promote and produce music festivals, do an awesome job of stirring the pot while leaving out a few ingredients. For example, when announcing festival lineups they will blur out some of the artists. This creates suspense, social engagement, and severe FOMO (fear of missing out). This is where Falcon.io’s content calendar plays a major role in helping the Founders team schedule their content. They are able to schedule content and collaborate with other team members in a shared calendar workflow. The Editorial Calendar in the Publish section of our platform allows teams to collaborate on content creation, including cross-channel editing. We also have a digital asset library called the Content Pool that allows users to upload and save any photo, video, text, or link on our platform, regardless of geographic location. 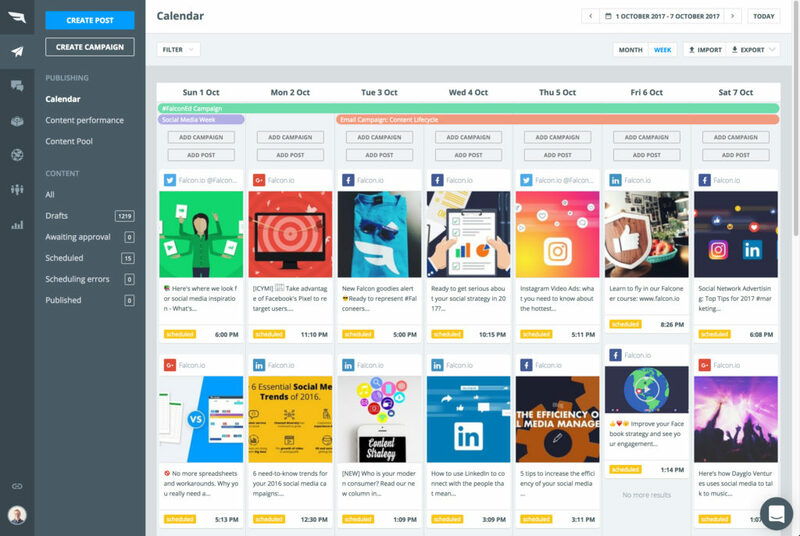 The Publish Editorial Calendar in Falcon lets you schedule all your social media posts and campaigns, with the time-saving help of the Content Pool. Engage feeds and profile cards: Who is waiting in your social inbox? I’m a big advocate of companies responding to every incoming message they receive—the good, the bad, and the ugly. For festivals, this is particularly important so that fans don’t feel ignored and are made aware of any on-site issues. These can include anything from lost property to water shortages, long bathroom lines, and disappointing performances. It’s vital to jump on every complaint and query as quickly as possible. The Engage social inbox in Falcon lets you customize feeds, share notes and assign messages to individual team members. This is where the setup and use of message feeds in our Engage section makes community management far more efficient. Engage allows you to segment specific conversations coming from the channels you have connected to our platform. It also allows you to create response templates for your community management. Templates save you a lot of time by enabling you to quickly turn around the most common questions. The Falcon platform also automatically creates profile cards for each person you interact with. You can add labels to identify VIPs and influencers while being able to see all past social interactions you have had with them. Ultimately, our Engage feeds can help individuals and teams handle huge volumes of incoming messages while providing an overview—and maintaining their sanity. Soaking up the sun with Founders Entertainment mural art in the background. Social listening: What is really going on out there? Real-time social media monitoring will help you prep for the possible and set up a gameplan for the impossible. With our Listen section, you can easily surface valuable insights such as influencer data, demographics, and trending topics or hashtags. It’s a great way to be aware of relevant online conversations. Some you would be advised to weigh in on, such as questions being asked about your festival facilities, while others may simply be worth monitoring to ensure they don’t escalate into a problem. The Listen social listening tool in Falcon informs you when and where your chosen terms show up across social media and sites such as forums and blogs. For each festival, you should have a concrete plan for the social listening you would like to do before, during, and after the event. Are people buzzing about certain artists more than others? Did a popular food vendor run out of food? Were people dissatisfied with performances at the festival? All of these thoughts are key to understanding the personal experiences of your festivalgoers. The grand finale of the three-day festival with Tool on stage. The Falcon platform is your one-stop shop for prepping and executing a fantastic social and customer experience strategy for any large-scale event. It gives you a complete ensemble of tools to monitor the social media buzz and hashtags flying about your event, as well as to track your campaign efforts. Crucially, the content calendar allows cross-functional teams to collaborate in real-time—so they can react and adapt at the high-octane pace required by a festival. Both the Falcon platform and our customer success team are geared to help you achieve the highest ROI on your social media and customer experience management. We love our jobs! The Falcon team onsite at the festival. We would love to help your team save time and avoid stress at your next big event! Download the case study below for the full story about Founders Entertainment and their stellar social customer care at The Governors Ball. See how Founders Entertainment rocked customer service at The Governors Ball.